I’ve been doing a lot more in the kitchen lately, well, by that I mean I’ve made one batch of soup, two loads of cupcakes and pancakes for breakfast once.. but I have been thinking about a lot of new things to attempt to bake/cook. Mostly they’re baking ideas, thank you pinterest, but there are so many delicious looking vegan recipe’s out there that it get’s hard to decided what to attempt first! So with all that in mind, I have decided to add a new tab to Love, Maisie and that’s FOOD! Don’t worry, I’m not changing the direction of my blog, at all, I’m just adding another little snippet of my life into my little online world! So expect a little recipe every now and then from me! 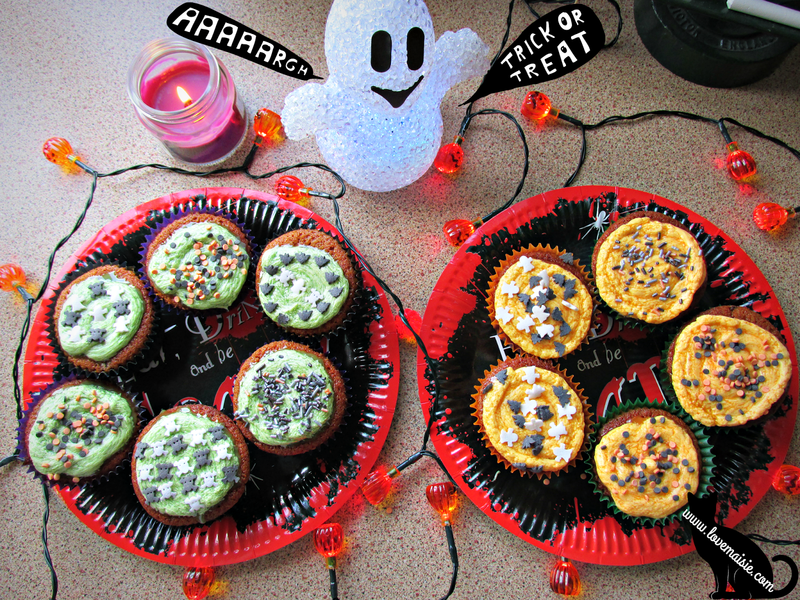 So seeing as Halloween is only 4 days away, I thought it was only right to share something Halloween related in today’s post, so I chose to try my hand at some Halloween cupcakes! I’ve made vegan/dairy free cupcakes a fair few times now but I think I’ve finally got the recipe perfect! I can’t take full credit for this recipe as it’s basically just a slightly varied version of the peta cupcakes, I think my way is better though, just sayin’. 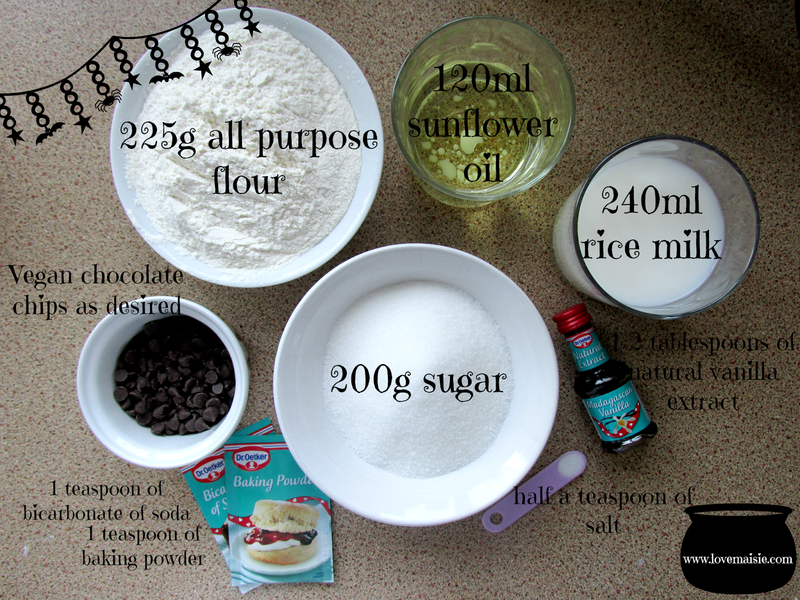 Simply measure out all your ingredients, mix all of your dry ingredients together before slowly adding all the wet ingredients and finally, the chocolate chips. I mixed my cupcake mix by hand but you can use a kitchenaid if you have one/if it’s easier for you. Using my ingredients list, your batter should be fairly similar looking to normal cupcake batter but slightly more runny! As I mentioned above, this recipe makes 12 cupcakes, so you’ll want to prepare a cupcake/muffin tray with paper cases, ready for you to spoon the mixture in to. I bought mine from Aldi for next to nothing, in a pack of 100 with black, purple, green and orange cases. You’ll then want to place the tray in a 180C pre-heated oven for around 18 minutes. Remember to allow your cupcakes to be completely cool before icing them! 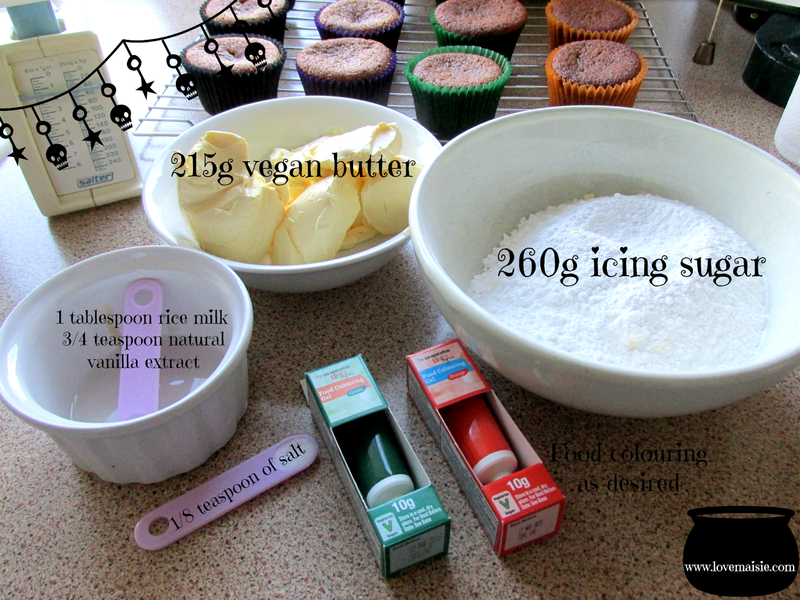 Mix all of your ingredients together, unless you’re making two different coloured butter creams, in which case mix everything bar the food colouring and separate your mixture in two. Depending on how much you have mixed/whipped your icing, you may need to pop it in the fridge or freezer for a short period of time, just to allow it to become slightly more firm, which’ll make it easier to use/pipe. To pipe, I placed my mixture’s into small food bags and snipped the ends which makes for super easy piping, but if you’ve got a piping bag and different nozzles then go wild! I chose to make green and orange icing, as they seemed the most apt colours for Halloween! I also bought a small tub of sugar decorations from Aldi, which included little ghosties, bats, skull and cross bones and a variety of different sprinkles, to decorate the icing! And viola! There are my chocolate chip, vegan, Halloween cupcakes! I think they taste absolutely delicious and everyone else that’s tried them hasn’t complained either! Let me know if you have a go at these cupcakes, they’re super easy to make and you can adjust the colour of the icing/the decorations for whatever time of year really! What are you doing for Halloween? Will you be doing any baking? Let me know! 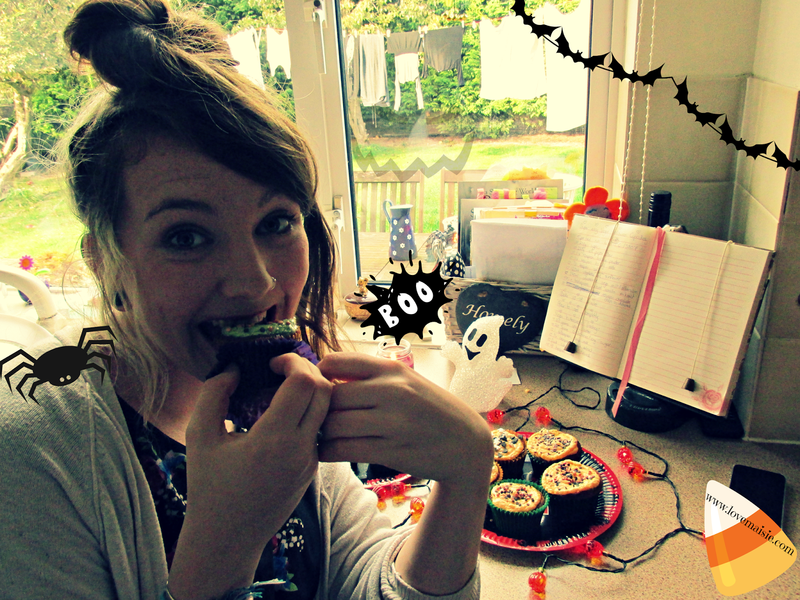 0 replies to Vegan Halloween Cupcakes | Bake With Me! These are so cute, I really want to make some Halloween cupcakes!